I'm kinda surprised that this doesn't already exist given that the toy scans are now out. I'm particularly interested in the BCR retail toy line. 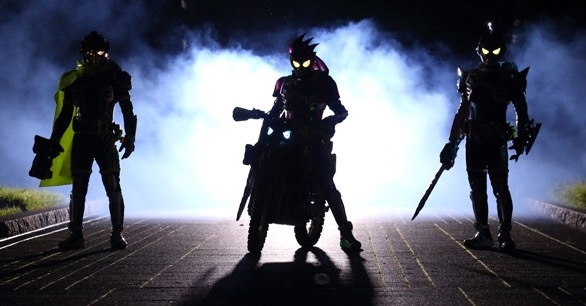 Although I was disappointed by the Ghost line and kinda "meh" on the execution of the Ex-Aid line, the first glance at Build's makes it look like it'll bypass the worst elements of those, specifically the clunkiness of the added armor. It looks like BCR works like W or OOO, with each release representing one form cleverly split in two halves. It looks like all the early figures are compatible with one another. I'm seeing most of the forms, although I can't tell what the form right next to NinNinComic is. It doesn't look like Rocket/Panda, exactly... maybe half of it is the Hedgehog form? I really like the look of Tank/Hedgehog, and I'd love to be able to put that together. What I like best is that it looks like they don't sacrifice the slash of right-side color on the left chest. Hey, could the red side of the red-and-white form maybe be a right side for Rabbit...? And do we think the FullBottles have a solid, static color intended to look like liquid (most likely), or d'you think maybe they actually found a way to fill them with something? What're the rest of you excited for in the initial solicits? FullBottles? The weapons? The form next to Nin-Nin Comic is Fire Hedgehog. I too am very interested in the BCR series, honestly considering going all in. Unfortunately, Rocket Panda and Octopus Light don't have scheduled BCR releases so far, and neither does Lock. I fear the former two may end up as Premium Bandai, but I have no idea what the hell they're gonna do with Lock. Dragon is definitely coming out since there's no way they won't release Claws, but that means they probably won't release Key Dragon, and I don't see them releasing a single half by itself. That the corresponding Full Bottle is a campaign item and that the form will probably see very little use make me fear that they won't release it at all, which would be a shame. If I do buy into the line, I really would want at least all 10 Best Matches. Also concerned about the apparent lack of head articulation, but I'll see where that goes. Not really interested in buying anything else, the DX stuff just doesn't entice me. Those little SD Gashapons also looked tempting though, even with the BCR series as an option. Last edited by barnstenchfartface; 07-18-2017 at 11:17 PM.. I doubt Lock will be the only FullBottle not paired with a unique other half. Maybe it'll get paired with another partner-less FullBottle, then released in BCR that way? Also, GOOD GRIEF that's a lot of forms. W had three until Fang/Joker came along. Build's got more than that just in his first quarter. Claws is certainly compatible, as he is in reality just Build with a little armor on top. Half of him is the same Dragon that makes up half of the Key Dragon form. And while it likely won't do happen in the show, the other half (which is just an embellished Dragon) should be equally compatible with all the other "organic" halves. Nightrogue and Bloodstalk I don't see being released in the BCR line, though, since they don't seem to have any real gimmicks. Hm? I think we're talking about different things. I believe Tokumonkey was asking about the form next to Nin-Nin Comic on the page showing the BCR figures, which would indeed be Fire Hedgehog. Hawk Gatling is next to Nin-Nin Comic on a page or two, namely the one listing the Full Bottle sets, but I don't think he'd be confused about that. Fire Hedgehog and Lion Cleaner are only difficult to identify because the BCR page is the only one on which they are shown. Last edited by Blade Fang; 07-19-2017 at 09:16 AM..
^Den-O will probably be Peach and Train.